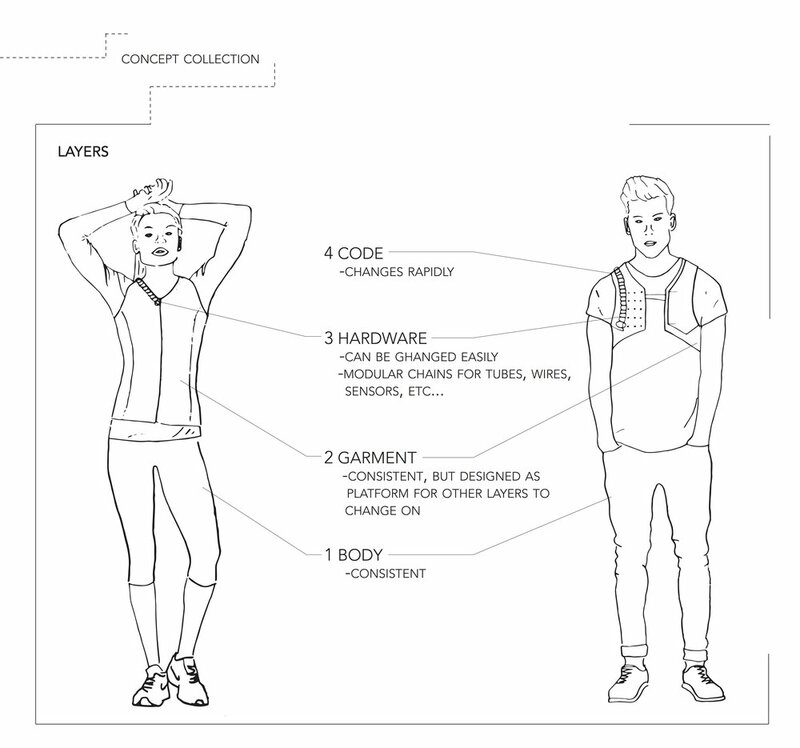 This modular wearable moves technology out of our bags and pockets and onto our bodies. Like jewelry, Links reflect personal style and wear like clothing. They are an exploration of best design practices for a future where hardware seamlessly integrates with our clothing and our bodies. The half-necklace link (blue) combines communications and biometrics in a jewelry-like chain designed to compliment the lightness and freedom of movement that comes with a dress. In this example each “link” serves a dedicated function, be it communications, sensing, or battery power. Links magnetic chain structure allow them to be easily moved from one article of clothing to another, and to flex with the natural movement of the body. They can go from a dress to gym attire in less than a second. Their magnetic structure also attaches them to a charging dock/wall storage unit. They are an example of how wearable technology can positively interact with clothing without being built into it. Integrating the development and obsolescence cycles of electronics and fashion would slow down the development of wearables while making both more disposable. Wearable tech can be broken down into four different layers, each with a different development speed and obsolescence cycle. This prototype features a functional dock that recharges imbedded lithium ion batteris. The layered system design was also aimed at establishing best practices for the integration of wearable technology and bio-implants.